The Dance of the Sugar Plum Fairy is full of wonder, especially at Christmas time. But some say the dance of the ostrich is the most beautiful dance of all in the animal kingdom. 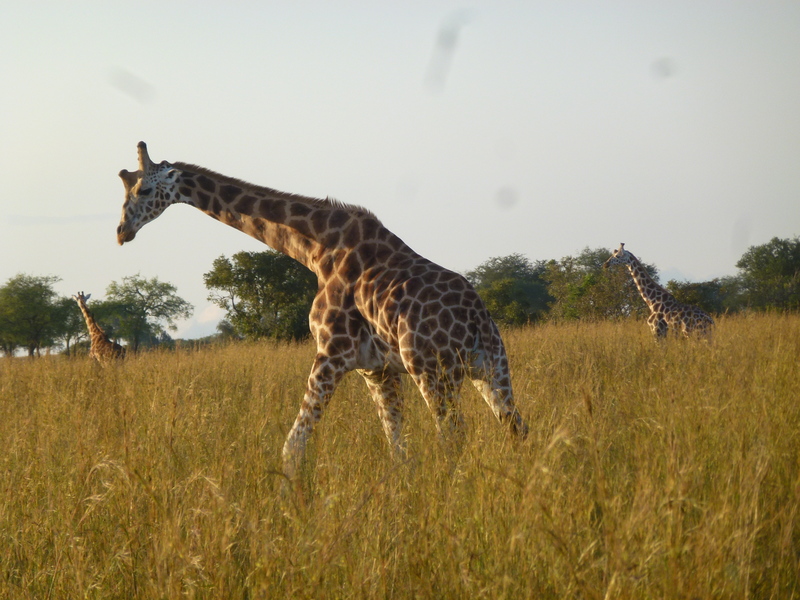 We are in Kidepo National Park, Uganda, a small area bordering South Sudan and Kenya. It is early morning and we have driven a long gravel road around zebras, a few elephants and through grim tsetse-fly-infested country to find the red-necked ostriches. Look. Finally. There they are. Sixteen ostriches are behaving as though as though they are sugar plum fairies. Small heads and graceful long necks turn as they sense the danger we bring simply by being here. Soft, generously plumed bodies flutter and whirl. A few ballerina-like pointe steps are taken before their strong two-toed feet propel them into ten-foot strides. And then they run. Who knows where we will find them next? They live in nomadic groups in the Sahel, the area between the desert in northern Africa and the grassland in the south. They are the fastest birds on earth and they do not (as some popular stories suggest) stand and bury their heads in the sand when they are afraid. They run when they are in danger. Because the population of ostriches has been decreasing dramatically for the past two hundred years, we need to be concerned about them and work to protect existing populations. I’ll think about the beautiful word we live in and the dance of the wild ostrich when we watch the Dance of the Sugar Plum Fairy this Christmas. Best wishes to all for a happy holiday season. 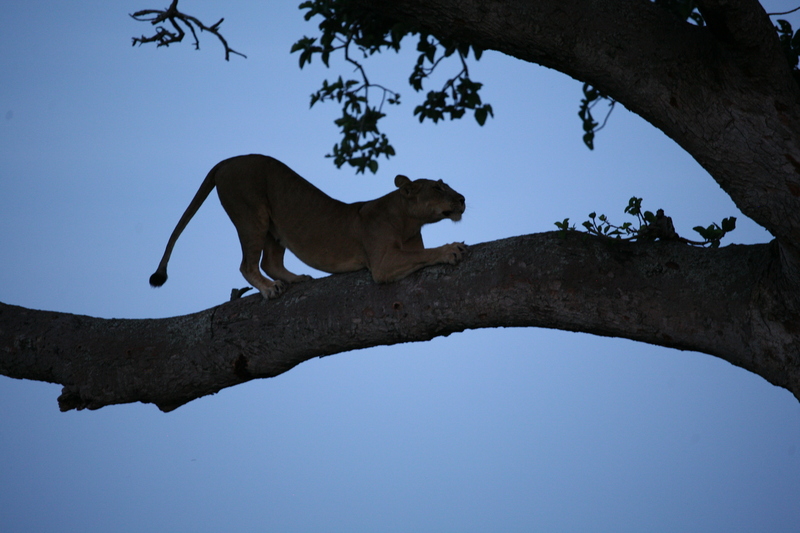 If these lions could talk would they be able to tell me why they like to climb trees?No one else seems to know why. 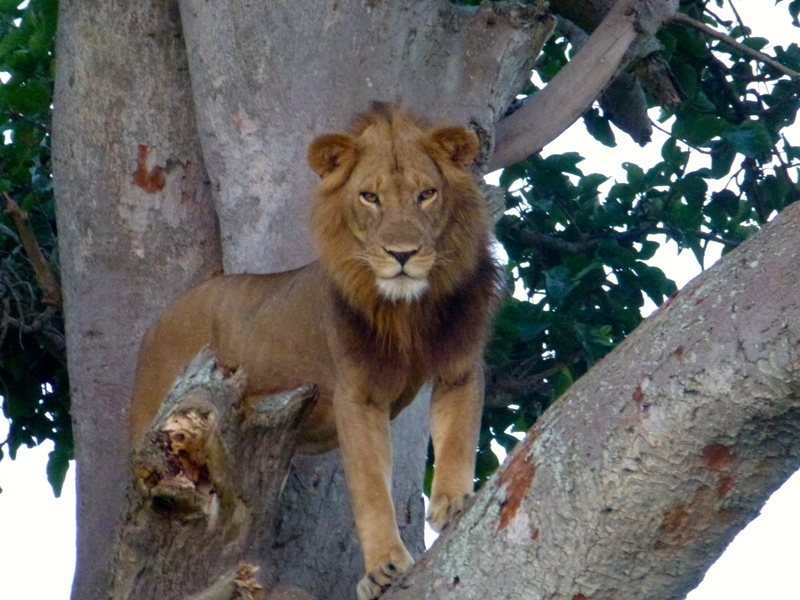 This is one of two places on earth where lions climb trees and I’m here to ask questions. 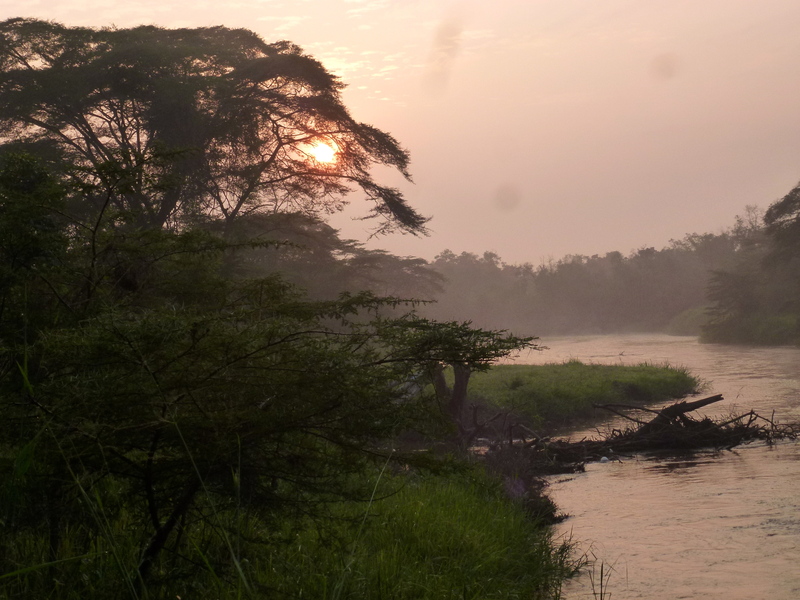 We are in the Ishasha Wilderness in the southwest section of the 2000 square kilometre Queen Elizabeth National Park, Uganda, bordering on the Democratic Republic of Congo. See that thing with a black tip switching in the tall grasses? That is a tail. The lions are waking up. It is five o’clock. The sun, a giant red ball in the mist, is sinking into the horizon. There are 20,000 African kob in Queen Elizabeth Park and it looks like they’ve all come to this spot. A few warthog families skitter around, thousands of savannah buffalo are on the perimeter, and the elephants are down by the river with the hippos. Switch, switch, now two lions tails wave around in the tall grass. One lion head pops up and looks around. In a few minutes the animal moves into a long slow stretch (you know it – the yoga Marjariasana pose or Cat pose.) Eventually she steels her way through the tall grasses to where another large head appears. This is the male. A beautiful, thick, dark mane outlines his face. He yawns and roars. The lion couple preen and socialize while their cub plays, and eventually they all get up and pad, with a purpose, to a gigantic Ficus tree. They climb it and settle down on its long, strong branches. 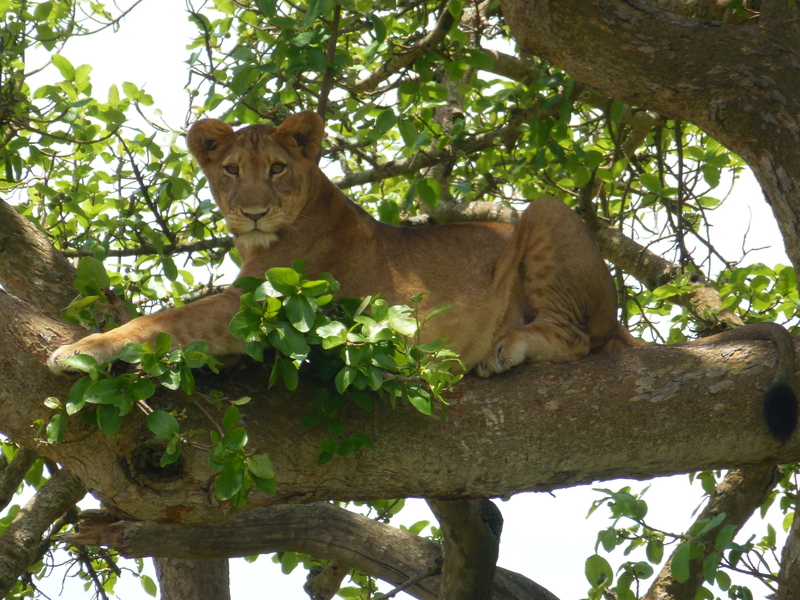 If the lions could talk would they tell me that they climb trees because they need to lie in the cool air above the hot grassland? (After all they have been sleeping and resting for twenty hours in the grass as the day gets hotter and hotter.) Or would they say they can no longer stand being bitten by the miserable tsetse flies that live in the grasses? Maybe they would simply say they need to get a better view of their dinner. 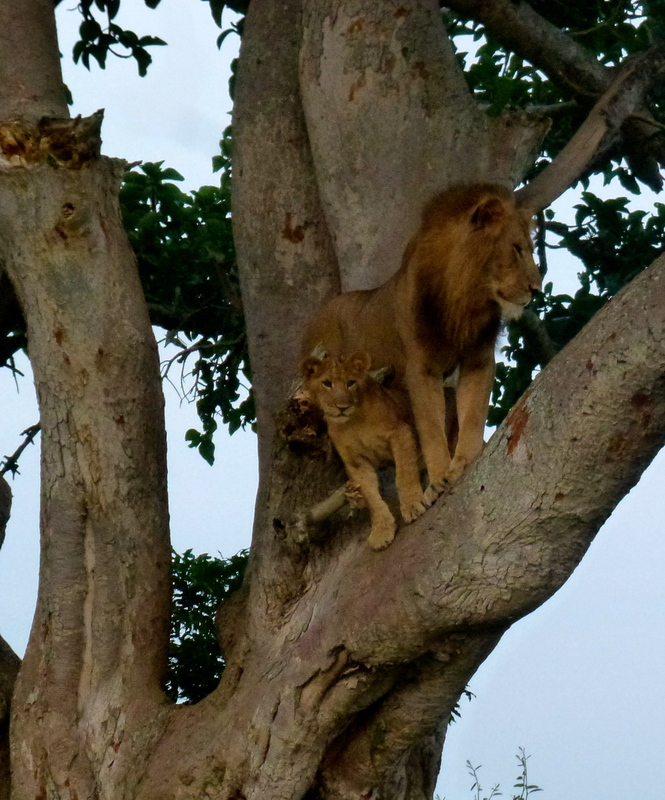 The lion family we see is especially small – a large male, a female and their cub. Life has been difficult for them. Originally there were two cubs. The female lion, like other lionesses, in human terms is known to be a poor, indifferent mother, who leaves her cubs alone and prey to danger for long periods. The big male, from his branch, scours the grassland to target kills, usually a weakling, in the hundreds of animals below the tree. The female, who is faster and more agile than the male, takes hunting orders from her man and sneaks down into the grassland. The male and his cub watch. When the kill is made, the male will take over and eat first. Then the female and other large animals will move in, and, at last, the young cub will have dinner. If he is lucky. But it is not easy to take down a kob or buffalo. 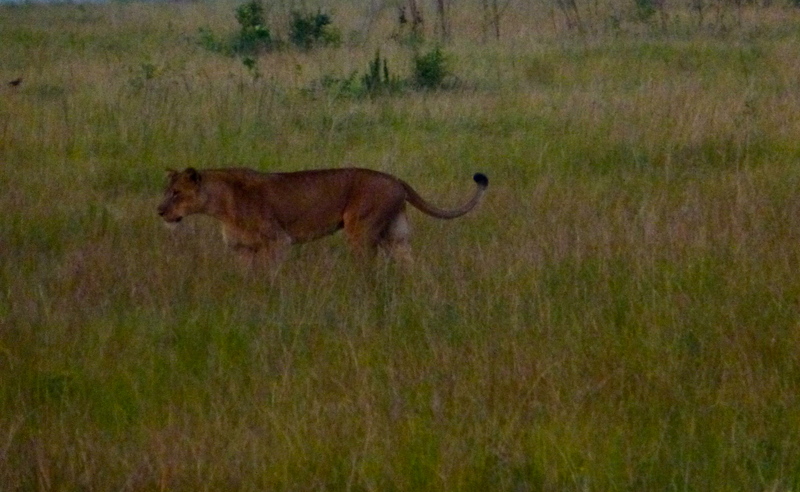 Yesterday we saw a young lion dragging his hind legs behind him as he crawled through the grass. Would he survive? Was his back broken by a buffalo? Would the park rangers and veterinarian be able to help him? The lion, the world’s largest cat after the tiger, is in danger. In the past twenty years, hunting wild game and wars have added to precarious nature of life on the savannah and the lion population in Uganda has decreased by thirty to fifty per cent. Tonight it is peaceful in Ishasha, Queen Elizabeth National Park. The wildlife in is protected; there is no hunting; the wars are finished. I’m thrilled to be here, to let nature be my guide, and to think about how we can live and work sustainably to protect nature. Snuggled in between South Sudan and Kenya in the far northwestern reaches of Uganda, Kidepo Valley National Park is one of Africa’s last great wilderness areas. After a torrential downpour an hour ago, the air is cooler and there is an eerie stillness. Smells of damp earth, elephant dung and wet grass fill the air. A big orange sun is sinking into the horizon behind rugged volcanic mountain peaks, and our excitement grows knowing that surprises lurk in the grasses and the fast approaching night. “It’s not a village. 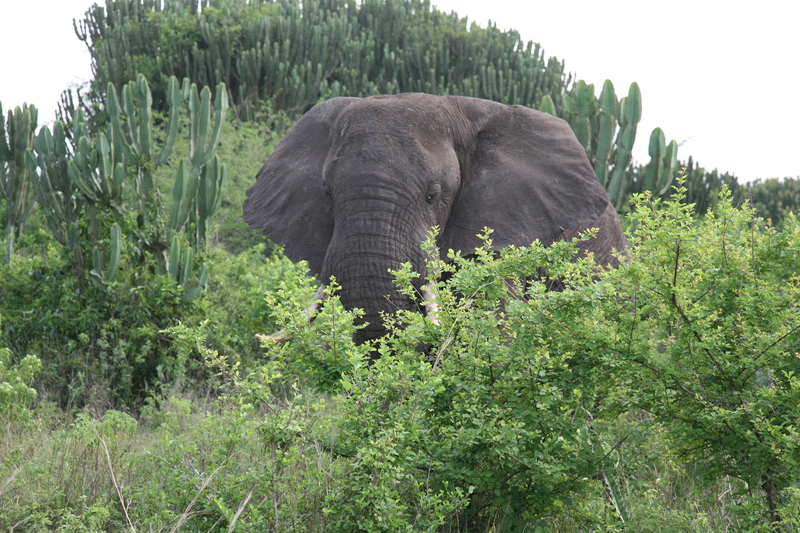 They are the elephants,” Patrick, who is an expert wildlife guide, born in the area, replies in a proud voice. 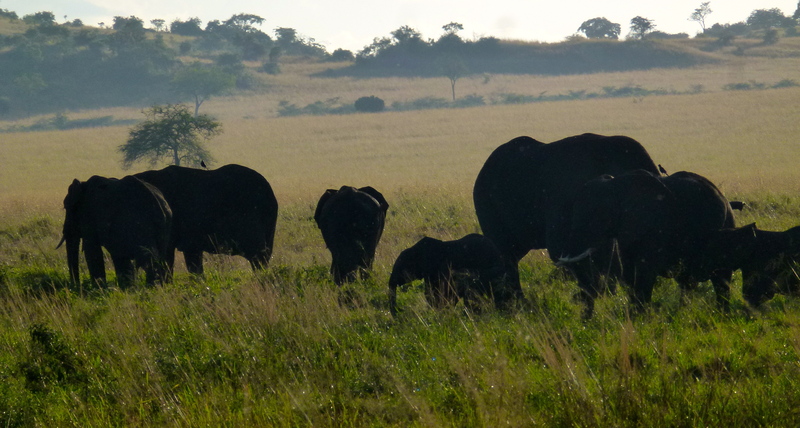 We keep our distance, but the matriarchal herd of forty-two huge elephants is unperturbed as they approach us. They’re feeding on the lush wet grass, stretching their trunks up once in a while to taste the delicious leaves of African Acacia trees that rise majestically out of the savannah. Baby elephants frolic about under the protective eye of their mothers, then bound back to them for vigorous quick feeds. 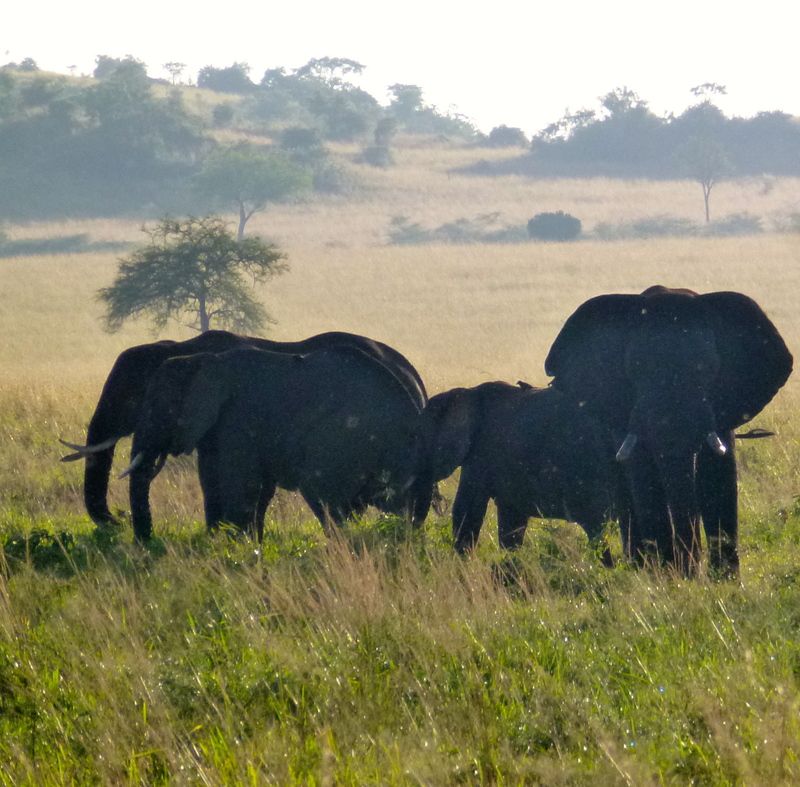 A handful of bull elephants watch on the perimeter of the herd. I’m mesmerized by the grace and family cohesiveness of the elephants but, although I could watch them forever, we need to move on. We still need to see if we can find out what happened to the lions. Our guides scan the high rocky outcrops. “Wondering Where the Lions Are,” Bruce Cockburn’s song, rings through my head. 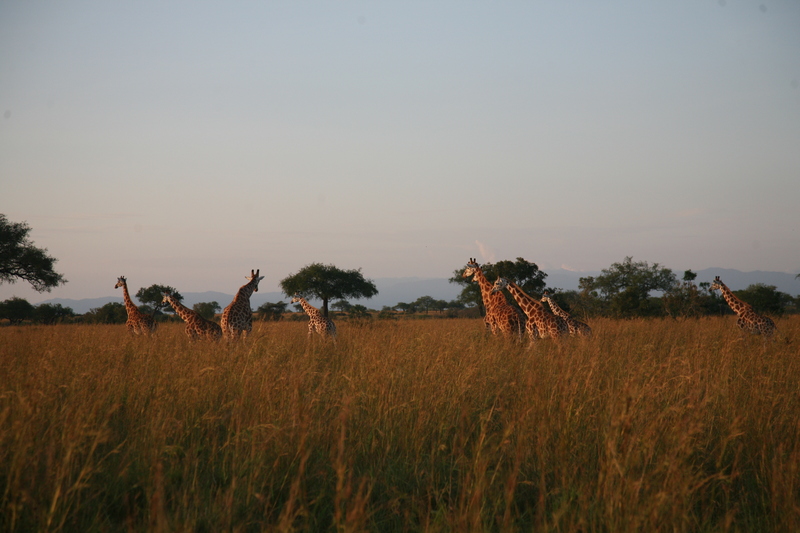 I strain my eyes, blinded by the low sun, and pick out a strange group of five or six cream and rosy brown, spotted towers in the grass It is a nursery group of fourteen Rothschild giraffes, with mothers suckling their babies and grazing on the leaves and bark of tall trees. Two huge male giraffes are on the side-lines. For now, the giraffes are safe. Their predators, the lions, are nowhere in sight. 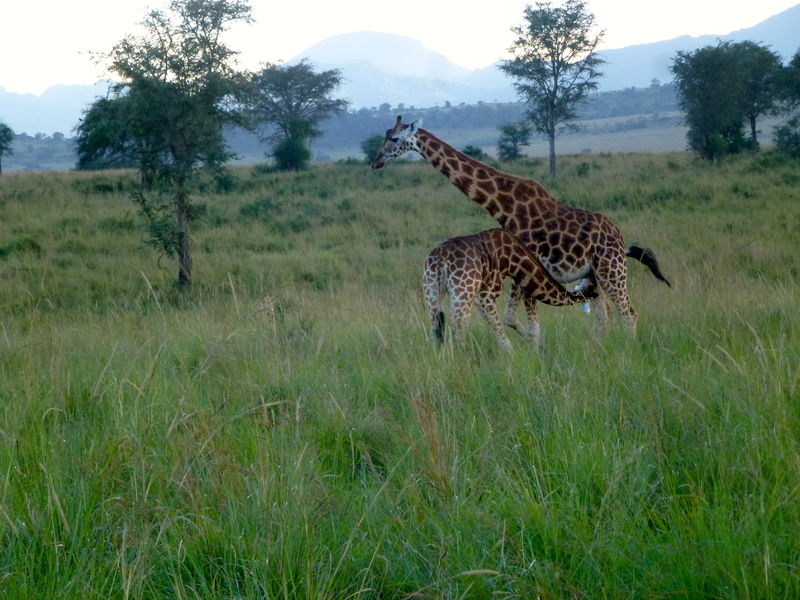 The number of Rothschild giraffes in Kidepo was a sustainable population of 400 in the 1960’s until poaching, hunting, Idi Amin’s reign of terror, and civil war in the 1970’s and 1980’s, disastrously reduced the population to a single female and two males by 1992. In an urgent effort to save them, three females and one male Rothschild giraffes were flown into Kidepo from Kenya, under the stewardship of the Uganda Wildlife Authority and the Kenyan Wildlife Authority. 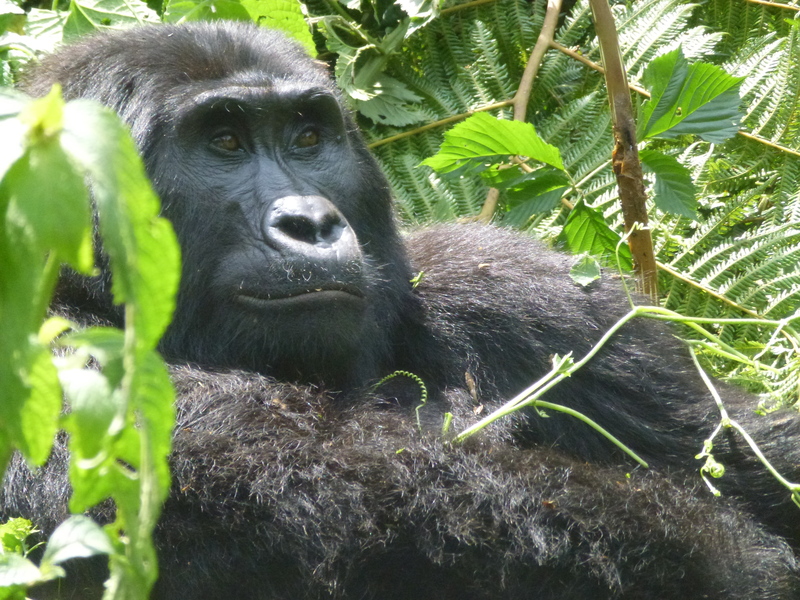 Some reports estimate that there are now 280 in Uganda but they still remain on the endangered species list. It’s an awesome sight to see fourteen of these beautiful animals together. The Rothschilds are the tallest giraffes on earth. Their babies are six feet tall at birth and adults weigh up to 2800 pounds. We speak in hushed whispers, careful not to disturb them. They are serene and gangly, but if we disturb them this evening they will run – at 56 kilometres an hour. Later we learn that “Tim,” Kidepo’s senior lion, survived his fight. It wasn’t his first. We find him the next day majestically perched on a rock outcrop above the savannah. There are no giraffes or elephants nearby but hundreds of kob and buffalo are grazing. I suppose Tim is planning the next dinner for his pride. 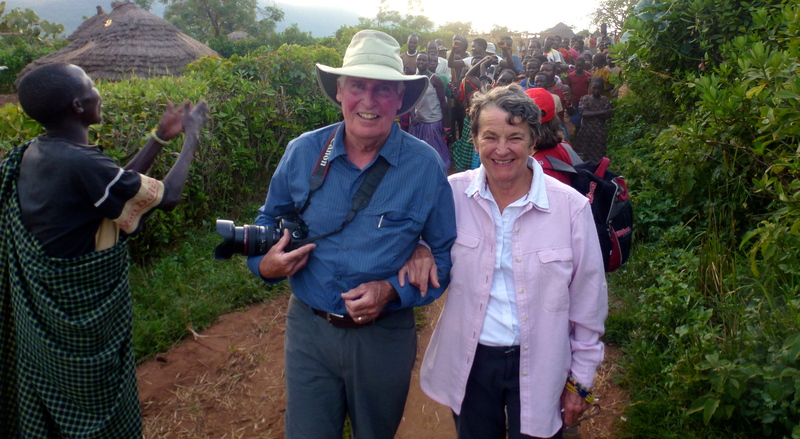 For now, all’s well in the Kidepo Valley. Into magic and down the mountain, I trek. New crops, a checkerboard of sweet potatoes, beans and Irish potatoes, are emerging from the terraced land’s iron-rich, red soil. Volcanoes tower above through the clouds. Giant Eucalyptus and flowering trees stretch up through the forest. We are in the southwest corner of Uganda, a few kilometres from the border with Rwanda and the Democratic Republic of Congo. Arthur, who carries my backpack, was born here. 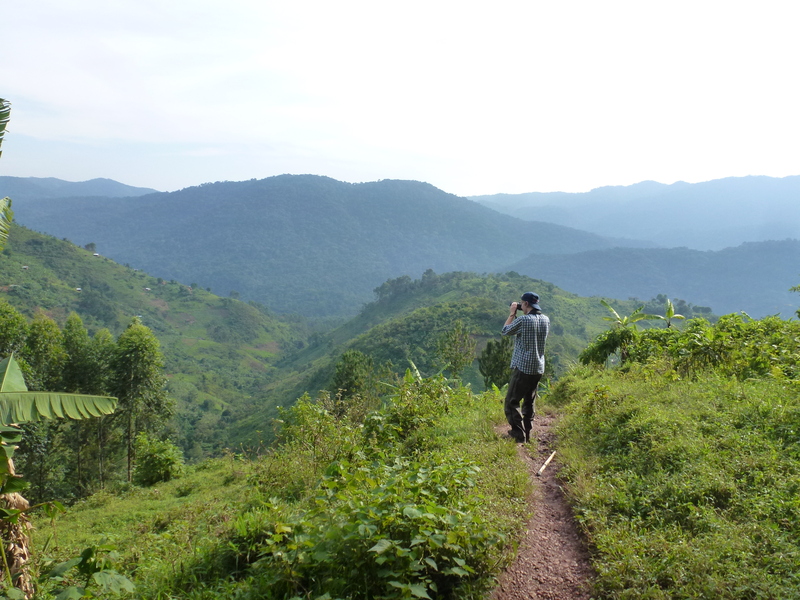 His strength and commitment to conservation is impressive as we track down, down, down, into the impenetrable forest with thick barbed vines grabbing us, and giant anthills to avoid. Listen to the birds, smell the rotting forest. Impenetrable: solid, thick, and unyielding. And there he is. Lying back on a thick hammock on vines about five feet below me is a young male gorilla…young but very large and healthy. He pays no attention to me as he happily grabs delicious leaves and green shoots around him with his large hairy hands and stuffs them into his mouth. I I have just one hour to be with this family of twenty gorillas. The little ones play, swinging on the branch of a tree until it bends to the ground, disturbing the great silverback below, protector of the family, who growls, telling them to be more careful. 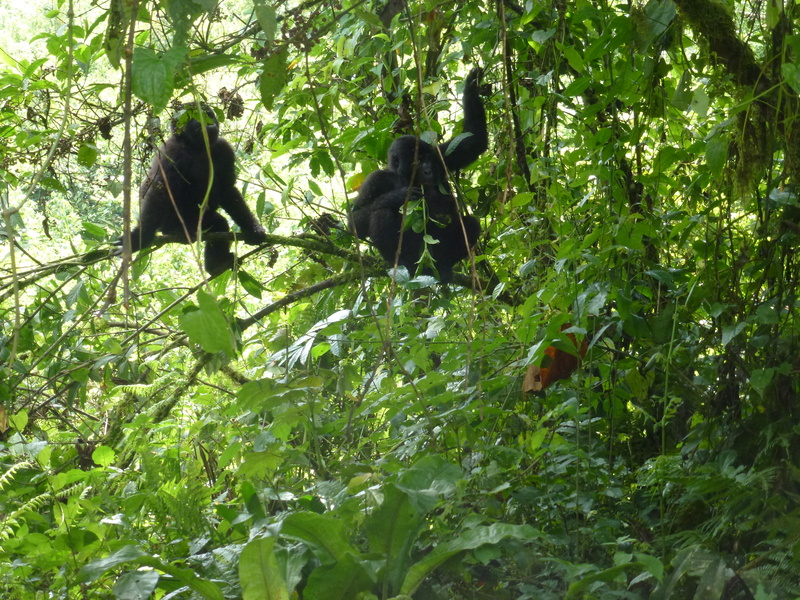 The older gorilla children, like human teenagers I’ve known, spend their time relaxing and feeding, pulling giants leaves off giant trees to eat. Two big males follow the silverback, learning their role in the family. 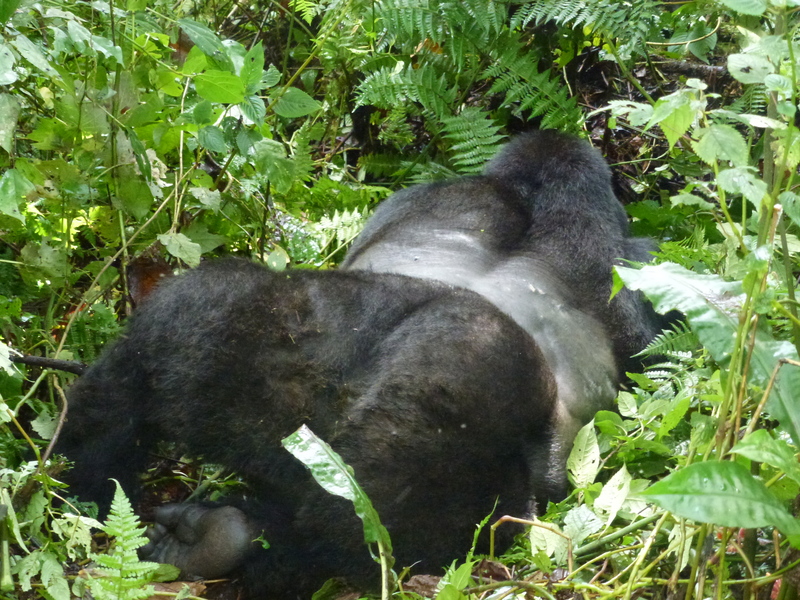 Then the big silverback tires, tolls over on his stomach, props his head in his hands and rests. 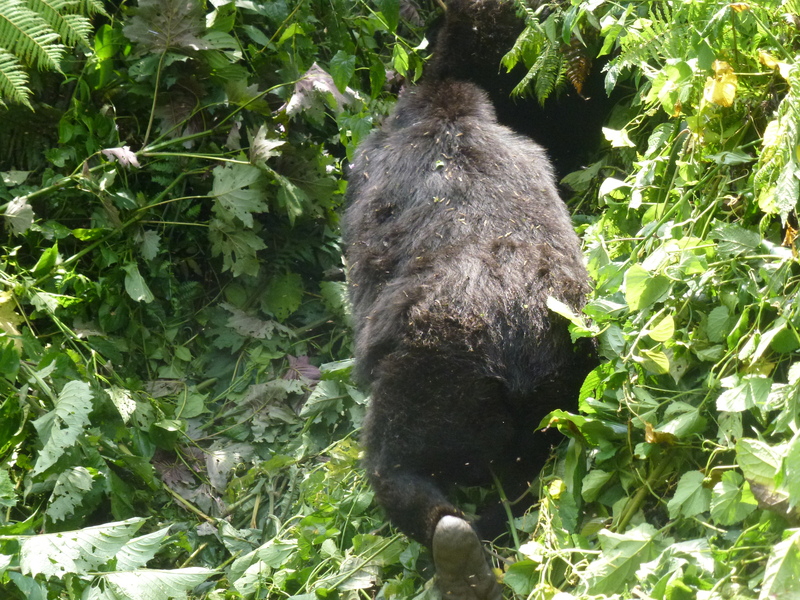 Mountain gorillas, our human ancestors, were almost extinct a dozen or so years ago. 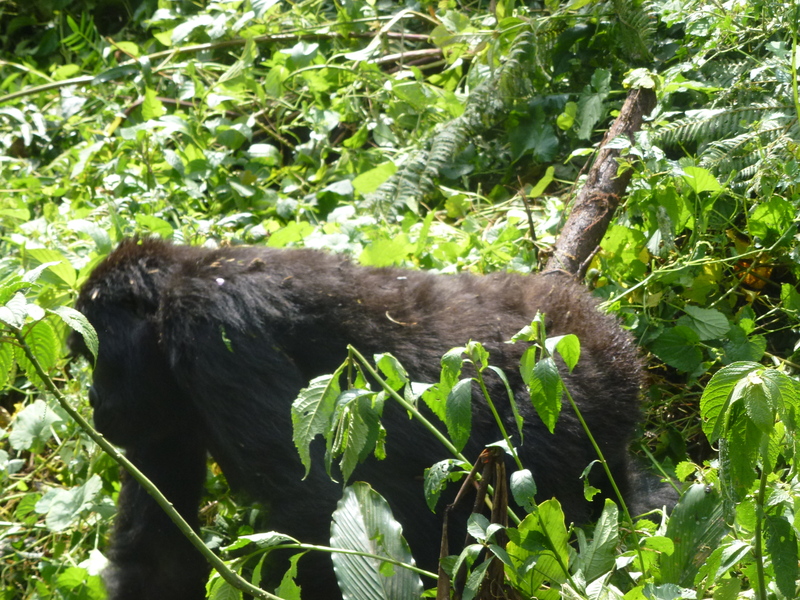 I am in awe of the conservation and education initiative in combination with an effort to improve sustainability of small communities near the National Park that have led to increased populations of mountain gorillas. Good-bye friends. ‘Till we meet again.